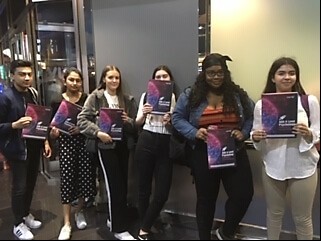 The Year 13 Psychology students joined other A level Psychology students at Vue Cinema, Star City on Friday 29th March for an interactive grade booster workshop ahead of their upcoming exams. We worked through practice questions, shared answers with the audience, voted for best answers, tested our knowledge and gathered valuable tips on how to get the highest marks in the exams. Students went away with a handy revision guide and found the experience useful. Feedback from our Psychology students was that they felt confident in what they already knew in comparison to students from other schools and the feedback from experienced presenters was helpful. It was a great day out for psychology students that gained a lot from the day.